Dawgs, we went road trippin again today. We left Port Aransas, home to the mother of all birds that are big, dark, and holey, those scary peli-can-eat-dawgs. 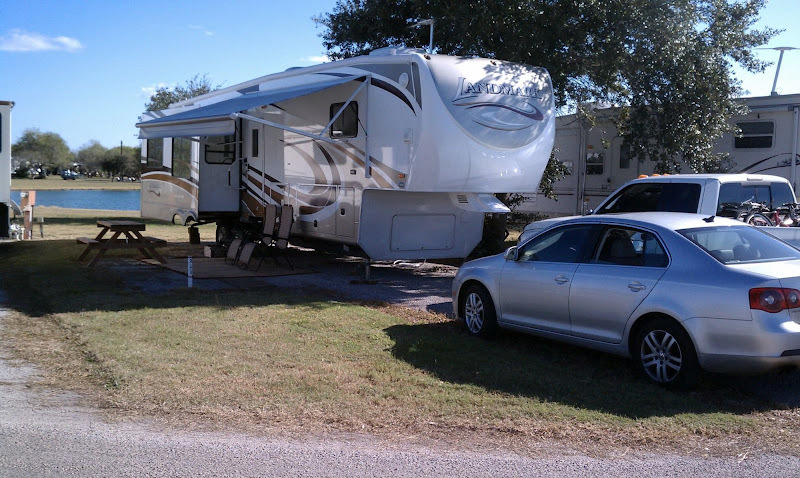 We drove to this new place that mom called BFE land while she laughed with glee as we zipped through the 70 mile per hour speed zone down this narrow, tarred and feathered, two-lane country road out to our new campground, the Sea Wind RV Resort in Riviera, TX. Our new neighborhood is pretty cool. It is right on Baffin Bay, and we have a really cool lake in our back yard too. Check out the view from our back window. Here is our site. Mom and pop originally picked out a different site on the lake. When pop started to back our dawghouse into the other site, the neighbor, who mom called the angry-almost-naked dude, came running out all discombobulated that we were trying to get into that site because he was mooching the power from it instead of his own site, and because he was using the water from that site to water his yard. And get this….he had three no dog signs around his site. WTH? After mom’s brief encounter with him, she said she decided she’d had enough of his internal caldron of anger and called the office to request different neighbors. Boy am I glad. Cause I really wanted to pee on his precious grass! Mom says I am a good dawg. I believe her. I mind her most of the time, like when she tells me to stop chewing on the kitties. But Boo is irressistable…I can’t help but chew on him when Mom or Pop is twitching him and tickling him. But I figured it out….when I get in trouble for chasing or chewing on Boo, I just give Mom the guilty-dawg grin. She’s such a sucker!! This gets me out of trouble almost everytime! So take notes class! If you are about to get in trouble, or if you are already in trouble, lay down and roll over on your back. Flop your legs out so that you are showing all of your stuff. Fold your front paws over, then grin really really big, so your teefers are showing…..just like this! Your humans will forget about the trouble you just caused, guaranteeeeeed!